Although bodybuilding success depends largely on the quality of your workouts, the quality of your diet has a significant influence on your results as well. During a bulking, or mass-building, phase, you can be a bit looser with your diet, as the aim is to establish a calorie surplus. However, when cutting weight for a competition, watching your food intake closely is essential for success. During a cut, carrots and other low-calorie foods can be effective choices. 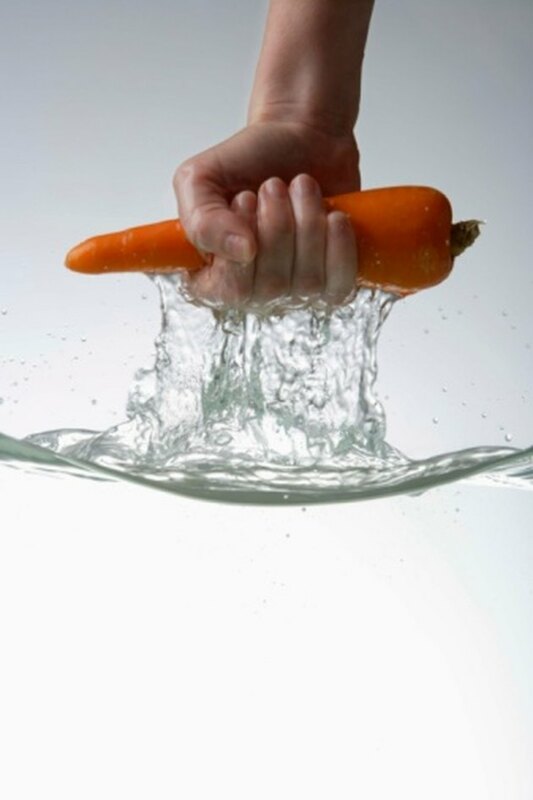 Carrots are beneficial for cutting in bodybuilding because they are low in calories. One cup of chopped carrots or a serving of 12 baby carrots provides just 35 calories. This amount comprises less than 2 percent of your total daily calorie intake. In addition, you can burn off 35 calories easily, as MayoClinic.com notes that a 60-minute weightlifting session burns 219 calories. If you are training regularly, carrots are unlikely to negatively impact your ability to reach the calorie deficit necessary for cutting weight. Carrots are low in carbohydrates, which can make them beneficial for cutting weight in bodybuilding. A serving of 12 baby carrots or one cup of chopped carrots provides just 9 g of carbohydrates. Although low-carbohydrate diets can be beneficial for weight loss, you might want to keep moderate levels of carbohydrates in your diet for optimal bodybuilding success. Research published in the April 2010 issue of the "European Journal of Applied Physiology" indicates that pairing intensive exercise with a low-carbohydrate diet can reduce your testosterone-to-cortisol ratio, creating a hormonal environment that is not conducive to muscle growth. Carrots contain close to no fat, with .3 g in one cup of chopped carrots. Because fat is calorie-dense, low-fat foods such as carrots can be helpful for dieting. but you might want to dip your carrots in a condiment that provides some fat, as fat provides satiety, which can prevent food cravings. Dips made with olive oil or other sources of omega-3 fatty acids might be particularly beneficial: A study published in the December 2007 issue of the "American Journal of Clinical Nutrition" suggests that omega-3 fatty acids can inhibit deposition. Carrots can be a helpful addition to your bodybuilding diet because they provide fiber. Each 1 cup serving of chopped carrots, or about 12 baby carrots, provides 2 g of fiber. Fiber can be beneficial for cutting weight because it helps make you feel full and increases the volume of your meal. As MayoClinic.com explains, this reduces the likelihood that you will overeat, which helps you stick to your diet.